The following content packages can be purchased and used along with the ArdenSuite. They target different issues in clinical routine and can be—for example—connected to the hospital’s EMR system. The application of these packages is completely flexible and can be implemented according to customer requirements. On-site configuration is also easily possible with the ArdenSuite IDE. Our clinical alert packages cover important clinical situations, offer to-dos and trends, support timeliness and completeness, and even monitor life-threatening events. Available monitoring and alert packages are troponin, kidney function, anemia and infection, potassium, and TSH. With our clinical alert packages in operation, mistakes—small or big—are prevented, patient safety increased, quality standards checked—for the benefit of the patient, the clinician, and the medical institution. 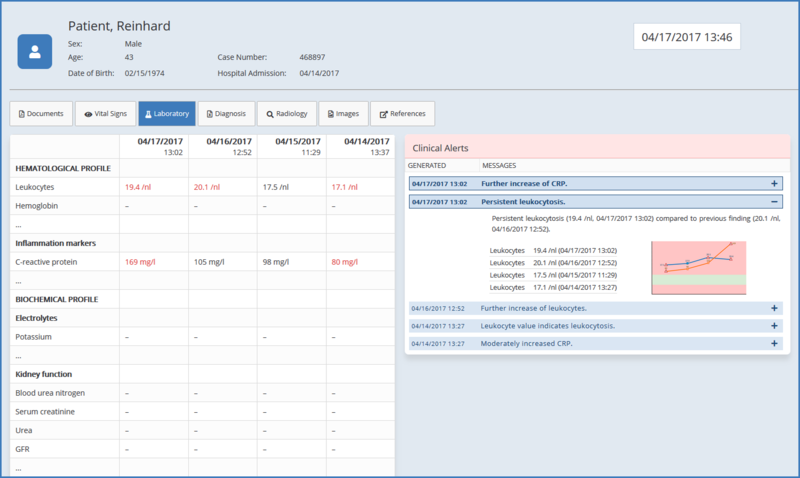 For this clinical event monitoring system, we identified several infection-related events relevant for ICU patients. For every ICU event, a notification can be generated in the EMR’s GUI. To this end, we developed distinct knowledge units based on specific medical rules and clinical knowledge. Required clinical data is obtained from connected data sources. Through the application of this knowledge to the obtained data, the occurrence of an ICU event is determined. Additionally, we implemented fuzzy concepts to allow the inclusion of borderline cases. Here, we indicate the following ICU events: shock, falling blood pressure, hypotension, and inflammation symptoms in sepsis. Microbiological event monitoring is a service for the analysis of microbiological laboratory test results. It provides a library of interoperable building blocks for the knowledge-based analysis of microbiology results. In this demo, we present a library for the generation of microbiological events related to the automated detection and surveillance of healthcare-associated infections (HAIs). In this library, each building block is responsible for the generation of a specific event; these events correspond with microbiological information elements that are frequently required by (international) HAI surveillance programs. In three patient cases, we show how the library generates five microbiological events related to information elements in the ECDC HAI surveillance program. Hepaxpert provides reliable interpretations for hepatitis A, B, and C serology test results. Hepaxpert’s extensive knowledge base includes all possible―even extremely rare and complex―test result combinations (more than 61.500) and covers the entire problem area. Hepaxpert’s automatically generated interpretive reports include a detailed analysis with regard to virus exposure, immunity, stage of illness, prognosis, and infectiousness. You will even find suggestions for further testing and individual vaccination recommendations in your report. Interested in one of these packages? Contact us today and request a quote. We will get back to you asap.